Have you ever seen someone pop out a partial denture? Perhaps they only wore their partial when going out in public, and the rest of the time they just coped with a gap in their teeth. Or maybe someone you know has confessed that they, too, had dental problems, but they got a bridge and now you can’t even tell that their teeth aren’t all their own. Partial dentures and bridgework are certainly options for people who are missing some teeth, but there is an even better choice for overall mouth health, versatility and comfort: Implant retained partial dentures. The word ‘denture’ may be off-putting for those who still have most of their natural teeth, but just need to fill in some gaps where teeth have been lost due to tooth decay, injury or extractions. Yet implant retained partial dentures are just a form of dental implants: single teeth, or groups of teeth, that are screwed into posts that are surgically implanted in your gums. 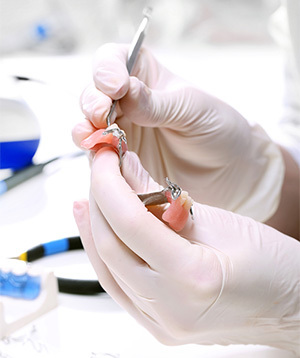 Once screwed in, the implant retained partials can only be removed by a dentist, which means you don’t have to remember to put your teeth in before leaving the house. 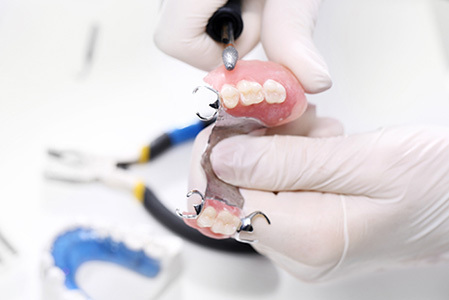 Bridgework has traditionally been a higher-end solution to the problem of missing teeth than partial removable dentures, but it does have its issues. While bridgework is in itself usually long-lasting, the fact that it’s not removable and is typically cemented to the surrounding teeth, means that people with bridgework are unusually prone to gum disease, as food gets caught between the bridgework and the supporting teeth and/or the gumline and cannot easily be flossed away. Infections can result from poor dental hygiene in any circumstance, but because the bridge relies on the health of the abutting teeth, the entire bridge can be compromised if one of these teeth fails, breaks or decays. 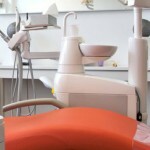 Another common challenge of a dental bridge is that it’s hard to make the teeth look natural, since they are sitting on top of the gums as opposed to actually emerging from the gums like your own teeth. What if your existing natural teeth beside the missing one(s), are weak or compromised and thus can’t support a bridge? 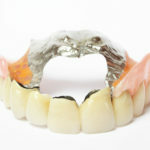 Individual single crowns with dental implants are a costly replacement, but behave much more like your original teeth. Implant retained partial dentures are a less costly, but very similar alternative, because multiple teeth can be supported by a single titanium post drilled into the jawline. Imagine replacing a few teeth, or even your complete upper or lower arch, with implant retained dentures that restore your self-confidence and allow you to resume your normal social activities with complete ease: It makes the idea of a removable denture, or even bridgework, seem positively prehistoric. 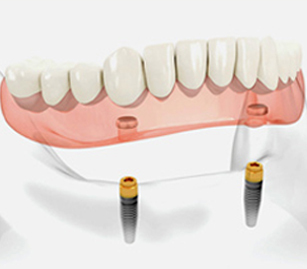 Implant retained partials are screwed securely into posts that are implanted in your jaw, where they provide structural support and prevent bone loss. They emerge from your gums just like your natural teeth, and allow you to chew all types of food just like your real teeth – and just like real teeth, you can floss between them with ease. No more forgetting to put your denture in, or causing wear and tear to your surrounding teeth by popping it in and out repeatedly. If it’s time to invest in your smile, with a lasting solution that offers all the benefits of your own teeth plus complete imperviousness to cavities, it’s time to stop by our clinic to take a look at some of the before-and-after pictures of our patients who are thrilled with their implant retained partials. You won’t believe you’re looking at patients who once had problems with their teeth!